I think it’s safe to say at this point that I messed up. It’s not the pattern; I know that for sure. The pattern is great! It was me. Somewhere along the way, I messed something up, and now I have a green, android bunny. He’d be good for Easter if it was the season. I can say for certain that I messed up somewhere in the beginning and just didn’t notice it until I started sewing on pieces. He should be a bit more stout, based on the pictures I’ve seen. Elsewhere, his arms turned out okay, the antennae are long for this body but are probably fine if you knit the body correct in the first place, and the feet are okay. Sigh. Well, I’m not giving up. 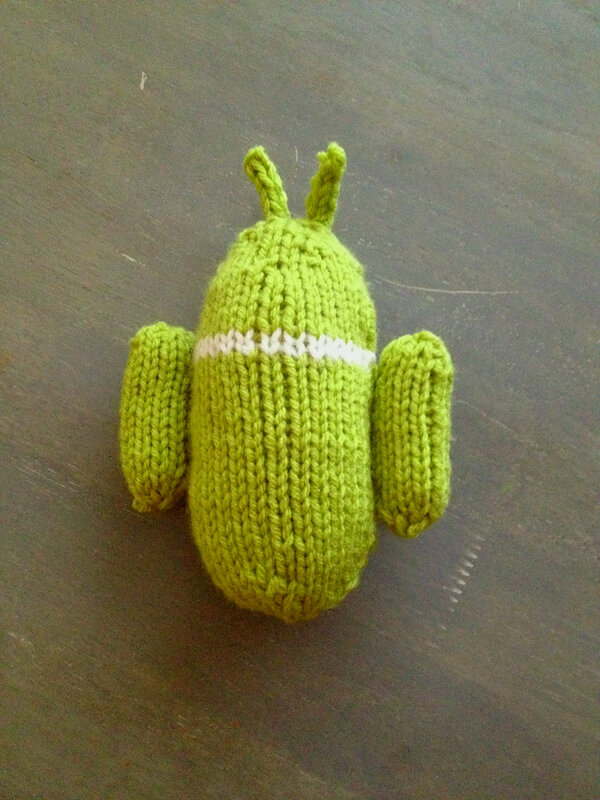 I still really want an Android knit. I’m thinking, I’ll finish sewing this one up and have an Android Bunny to hold onto for Easter or to give to my older younger brother who loves random things that don’t quite turn out right. Then, I’ll cast on another one. I will get this right! I did take a break from working on this project this weekend. A while back, I had started a yellow shawl, which uses the same pattern I used for my mom’s shawl. I’d been thinking about working on it, so I decided to go for it. I didn’t get a whole lot done this weekend, though, maybe a couple of rows. It was just one of those crazy, run-around weekends. Friday, husband had off work and I was done with Employee Awards Day fairly early. I ended up going to bed and crashing for 2 and a half to 3 hours, still exhausted from Thursday. That evening, we went to see What to Expect When You’re Expecting, which was fun. I was shocked. I didn’t ask to see it; husband asked me if I wanted to see it. Then, Sunday was the church picnic at my parents’ church, so we traveled out to visit them. Oh, and I cleaned my house. If you knew me well, you’d know that that just doesn’t happen; I hate cleaning. This week will be a fun week. Wednesday (23rd), I celebrate my 1 year anniversary working at my job. I’m so thrilled and ecstatic. Honestly, I don’t think I could’ve gotten any luckier last year. See, the day after, too, is my birthday. So, last year, I started my first full-time job (dream job, no less! This was the career I was aiming for) the day before my birthday. To make it more fun, I think I’m getting yarn for my birthday from the older younger brother. He was up in the DFW area last week to take his FAA test (which he says he thinks went well!). In the afternoon, I got this text asking for directions to a new yarn store that just opened in Fort Worth: MadTosh. How much fun would new yarn be? I know, I know, I don’t actually need it, but that doesn’t mean I’d be any less thrilled! What did you do this weekend? Did you have a good time?